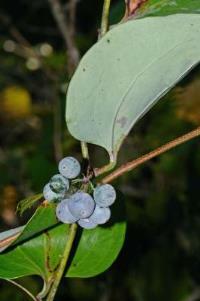 Smilax glauca.Gary P. Fleming.Atlas of the Virginia Flora.2014. Virginia Botanical Associates, Blacksburg.www.vaplantatlas. org (Accessed 5/2014). Smilax glauca is a slender, woody vine, monocotyledon, climbing by tendrils arising in pairs from base of leaf stalk, not climbing very high, prickly, often dense on lower stem, at nodes above, vine, stems often with waxy bloom, green to gray-black, stems of woody monocotyledons do not increase in diameter with age. Leaves alternate, stalk slightly sheathing at base, blade 5-9 cm long half to 3/4 as wide, rather dull, blue-green above, waxy-white below, heart-shaped-rounded to triangular, often patterned white by leaf-miners, semi-evergreen, major veins mostly 3-5, palmate, margins smooth. 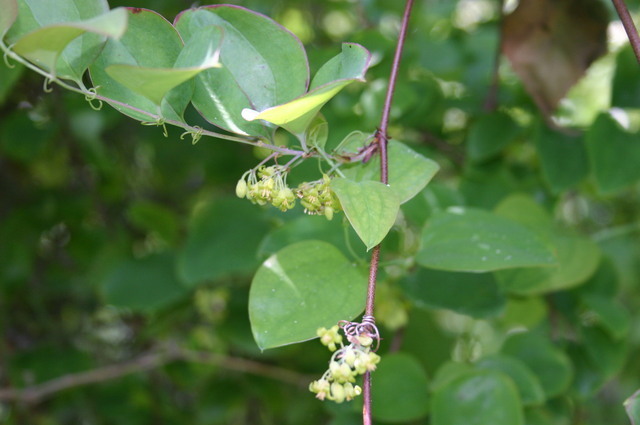 Smilax glauca.© Les Mehrhoff, 2008-2010 · 5.discoverlife.org (Accessed 6/2015). Flowers greenish-yellow, small, on stalks longer than leaf stalks, males and females on separate plants (dioecious); blooms May-June. Fruit blue-black, pulp lipid <10%, fruit persistent through winter, bird dispersed, eaten by birds & mammals. Habitat: Open woods, sandy soil, burned over areas, uplands. Often found with Smilax rotundifolia but appears more drought tolerant. Notes: Stems and foliage eaten by deer, rabbits.